Arsenal Ladies boss Pedro Martinez Losa believes the best is yet to come from his side after their come-from-behind victory over Notts County. 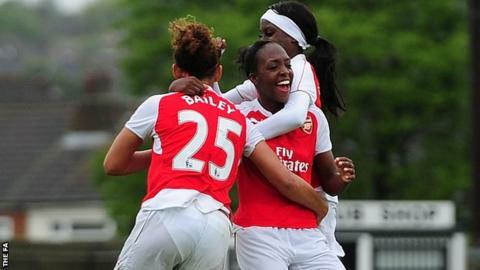 The Gunners' 2-1 win ensured they remained second in WSL One, level on points with leaders Sunderland. "Now we are believing in what we do. There are still a few games left in the league," Losa told BBC Sport. "The best of Arsenal is still coming, I'm positive with the team. Hopefully we can convert with results." Spanish international Natalia grabbed Arsenal's winner after England Under-23 international striker Dan Carter headed in her first league goal of the season to level the scores. "She needed that one. She deserves it, she's very honest," Losa said of Carter. "She's giving us 120% every day in training and playing. She just needed a little lucky moment to score a goal. "I was very happy for her and probably we are going to see a fantastic Dan Carter at the end of the league."